Do You Ever Just Crave a SALAD BAR? I Did All Weekend… and Did Something About It! | Keep It Up, David! I craved a salad bar all weekend. I think it’s because the amount of fresh food in my house has been rapidly dwindling, since I leave tomorrow for a week-long trip (more on that in upcoming posts! ), and I’ve been in ‘eat up everything so it doesn’t go bad while I’m gone’ mode, instead of ‘have lots of healthy options on hand’ mode. Plus, my Sunday was very productive, and I was hungry. I had slept in that morning, but once I got up I was on the go: a great workout running stairs at the amphitheater at Occidental College, plus walks with JJ, errands, and cleaning, laundry, and packing for my trip. I ate a late breakfast, and no lunch, so by dinner I was ravenous. Ravenous for a salad bar! I could have gone to Whole Foods or Sprouts for a salad bar, but I didn’t want to drive that far. But there was an immediate option in my neighborhood, less than a mile away… a SIZZLER! I’m pretty sure Sizzler is mostly along the west coast, so for everyone else that isn’t in the know: Sizzler bills itself as an affordable steak and seafood restaurant. You order your entree at the counter, and they bring it out to you at your table. There’s also a salad bar, which includes a hot appetizer station and a sundae bar. I think most entrees include a trip to the salad bar, or you can tack on unlimited trips for $5.49, which is what I did. Load up on veggies and plant-based toppings (like olives), but skip starches and high-carb options, like potatoes and corn. Proteins are fine, like hard-boiled egg or chicken pieces. 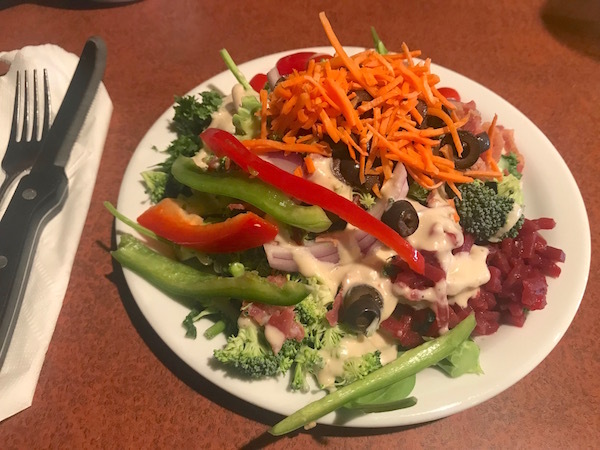 Since I had ordered protein as my entree, I went easy on protein at the salad bar, except this plate had some bacon bits. No bread- or flour-based toppings (like croutons, wonton strips, crackers, etc.). 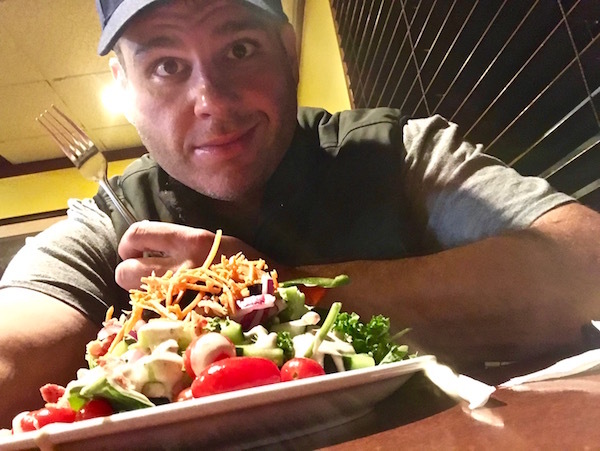 I tend to skip grains, too, even healthy ones like quinoa, because it goes against my salad bar objectives, which is veggies! My entree came as I was finishing up my first plate. 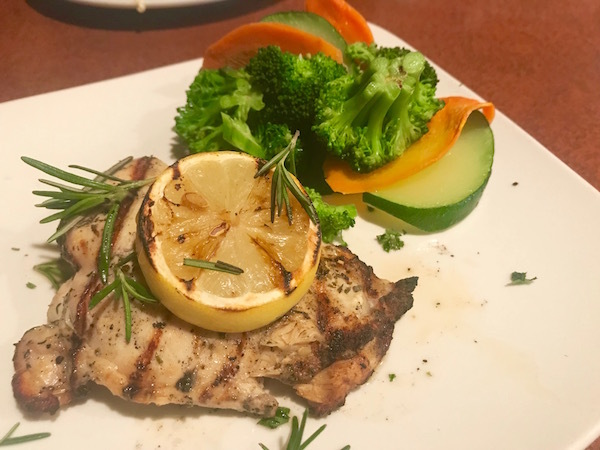 I ordered Italian Herb Chicken, with steamed veggies on the side. The grilled lemon was a nice touch. I was still hungry, so back for more veggies! They had a pre-made seafood salad, which already had a mayo-based dressing, so I added a spoonful of that on top. I also added a spoonful of guacamole from the taco bar (which was a hot appetizer option). Because of those two additions, I didn’t add any additional dressing. I toyed with going back for more, and decided to go back for a little dessert. 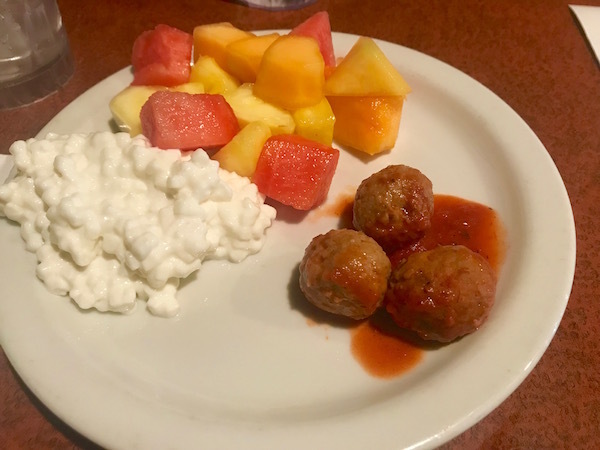 Before I got to the dessert area, though, I noticed that they had replenished the meatballs at the hot appetizer station, which I had my eye on earlier, so I grabbed three of those. 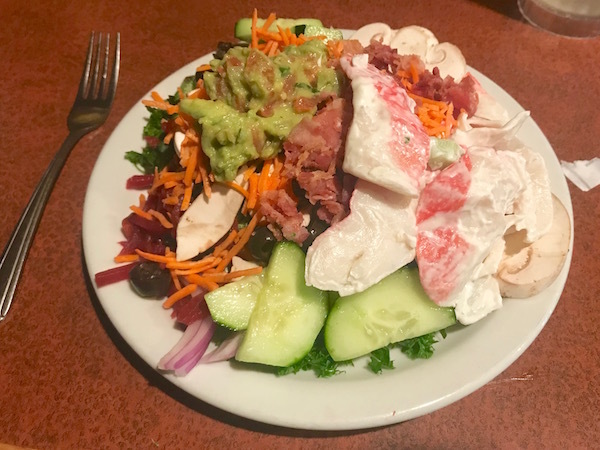 For desserts, they have a soft-serve ice cream machine and various toppings, plus a few dessert-y things like pudding, jello, and flan, but I skipped all of that and did a scoop of cottage cheese and fresh fruit – pineapple, cantaloupe and watermelon. All that for $16.95 + tip! The salad bar hit the spot, and I noticed, on the way out, that they sold salad-bar-to-go containers. Maybe I’ll make use of that in the future! This entry was posted on Sunday, November 18th, 2018 at 10:06 pm and is filed under Uncategorized. You can follow any responses to this entry through the RSS 2.0 feed. You can leave a response, or trackback from your own site. 3 Responses to Do You Ever Just Crave a SALAD BAR? I Did All Weekend… and Did Something About It! I have been craving a good salad bar (just told my puffiness this weekend)…now I’m really craving it even more!!! I opted for a Whole Foods buffet today featuring a yummy hot-protein trio of lemon-caper whitefish, super-tender pork carnitas, & herb-crusted turkey breast for $9.98 (1.11 pounds). Also had an obligatory assortment of organic veggies for $7.37 (0.82 pounds). $17.35 total, which probably beats your Sizzler total since I didn’t have to tip. The only starch/bread-based ingredient I couldn’t resist sampling with the hot protein was “kimchi-mushroom stuffing” for its novel, eclectic ingredients. I realize this wasn’t your Thanksgiving post, but still wanted to say “thanks” for all your interesting blog-posts this past year! Thank you. I appreciate it. And the Whole Foods spread sounds delicious!